Man Made Monster is a short sci-fi horror movie from director George Waggner. Released on March 28th, 1941, this fifty-nine minute small-length feature from Universal Pictures features a huge cast. Lon Chaney Jr. stars alongside Lionel Atwill, Anne Nagel, Frank Albertson, Samuel S. Hinds and even Constance Bergen. Even with these actors and actresses, it was one of the cheapest films Universal produced that year. 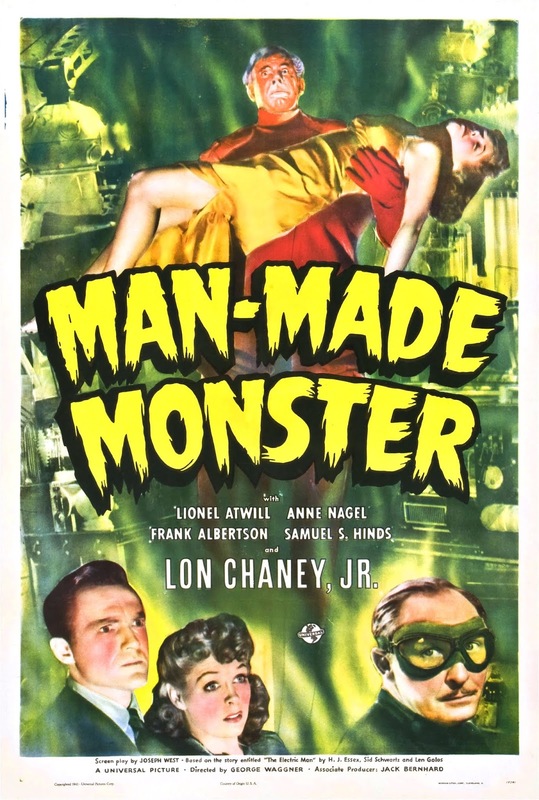 Man Made Monster had an estimated budget of $86,000. And it did pretty well at the box-office. The film is about a stunt performer named “Big Dan” played by Lon Chaney Jr. Big Dan appears to have an immunity from electricity following a bus crash that had seen the electrocution death of five other people. Our hero Dan falls in with a strange mad-scientist that’s obsessed with electricity. Obsessed with pouring loads of it into Dan to create a sort-of superhero. A strange plot that seemed out of place among the killer ape movies of the period. 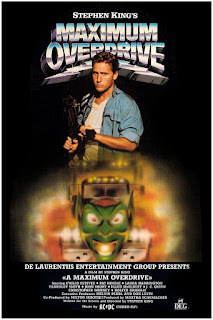 Man Made Monster is a movie I can safely say has been overlooked. It’s a high-quality film that was literally made from nothing. Yet it’s highly entertaining and important for launching the career of Lon Chaney Jr. with Universal. I had a great time watching this. Everything from the effects, down to the acting is really good. The story is original and felt great considering the time it was made. It’s not a movie that every horror movie fan needs to bare witness too before dying. 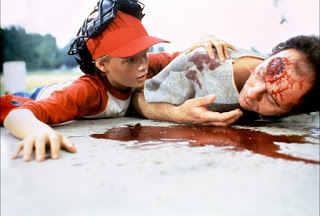 But it’s a great little picture that aches to be appreciated during a late-night horror movie marathon. Terrifier is a 2017 supernatural horror movie from director Damien Leone and Epic Pictures Group. It’s based on a segment that appeared in the Damien Leone picture, All Hallows Eve. The film stars small time actors like Jenna Kanell and Catherine Corcoran alongside character actor, David Howard Thornton as the lead villain Art the Clown. It’s an independent feature that really pushes the boundaries with it’s graphic murders and gory special effects. All packaged up with a grindhouse estetic that makes it all the more creepy and cool. Tara and Dawn get stranded downtown while heading home on Halloween night. Both are way too drunk to drive and are stuck in a really bad part of town. To make matters worse, they are being stalked by an extremely creepy clown that has a favorite pastime of slicing and dicing his victims. Now, Tara and Dawn have to try to survive the night with Vicky, Tara’s sister, on the way to pick them up. The special effects in this movie are awesome! Tom Savini would be proud. All practical effects, and nary a drop of computer generated blood. The filmmakers aren’t afraid to let loose with just about every kill. In fact I would hope you could make it past the opening kill. It’s stomach churning in all the right ways. Art the Clown did a great job of being the main stalker in the movie. His kills were brutal and realistic. The live body dissection is the main scene that stands out for most people. It’s gross. There are a lot of downsides. The writing is a little shoddy and they tend to pad out scenes with filler dialogue and pointless cuts. There is a delusional woman wandering around the picture that carries a doll she believes is her child. Art finds the woman and kills her. But I didn’t really see what purpose she held or why they included her. It felt a bit random. Also, the movie is pointless. There isn’t really a coherent story that’s being told, it’s mostly just killing in a clown outfit with the usual tropes. Most of the actors leave a lot to be desired. However, David Howard Thornton does a great job as our terrifying clown killer. He is exactly what nightmares are made of. His mannerisms are down to a tee. Watching it back again, I was able to pick out the nuances that Thornton brought to the character. Everything worked so well and he was more than just a freaky clown. Art the Clown is the menacing force that brings the title to life. Terrifier. The other actors are going through the motions of generic horror roles. They don’t bring a whole lot to the party. But who cares!? This isn’t about the acting. It’s a horror movie. You came for the slicing and dicing. That’s just what Terrifier delivers. 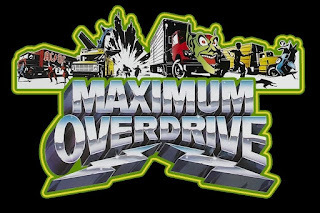 Maximum Overdrive is a 1986 science-fiction horror comedy film from writer/director, Stephen King, and producer Dino De Laurentiis. 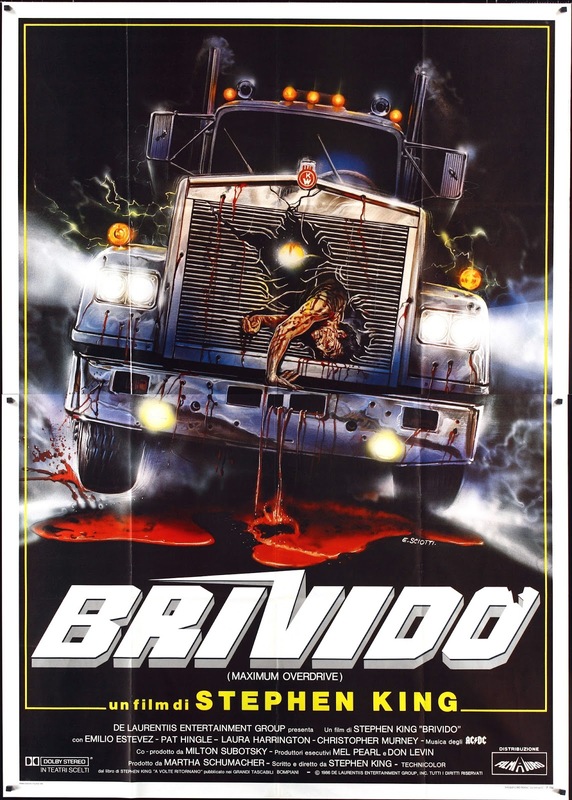 It’s loosely based on the short story “trucks” that appeared in the Night Shift collection. 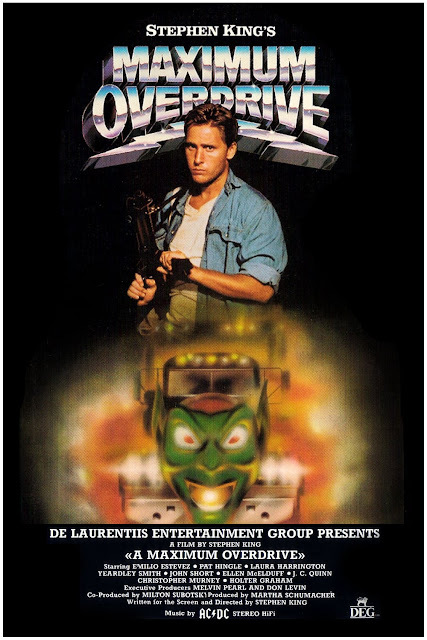 However, this is a mostly original feature written by King directly for the silver screen. 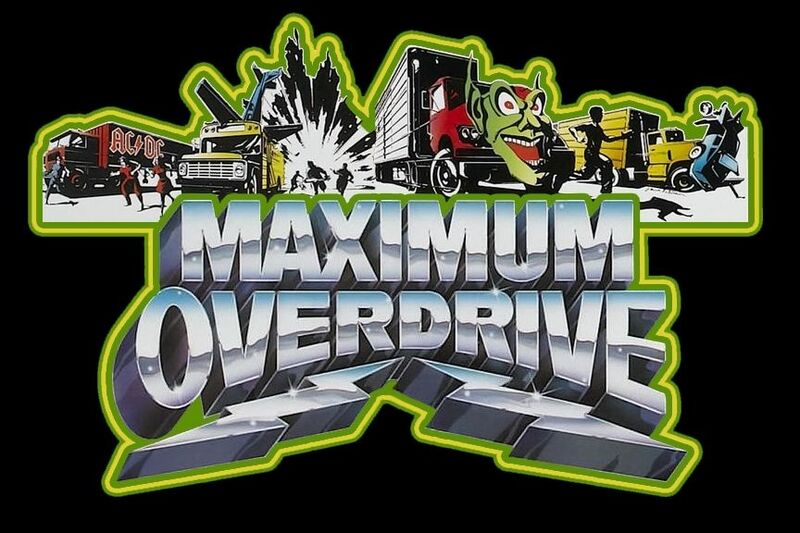 The soundtrack is proudly provided by the power-rock band AC/DC, who’s album Who Made Who was the official soundtrack. The movie stars “Mr. Cool” Emilio Estevez, Pat Hingle, Laura Harrington, and Lisa Simpson herself, Yeardley Smith. It’s cool to see her in this movie. But her voice is like a power saw. A comet flies too close to Earth and makes all electronics rebel against their human users. ATM’s are insulting their patrons. Arcades are electrocuting the gamers. Drink machines are pelting poor coaches. And a small group of travelers is being held hostage in the Dixie-Boy Diner by a group of menacing autonomous semi-trucks. Can the humans prevail over the machines they created? Why did a toy police car kill a dog? This was Stephen King’s first and only directorial feature. Dozens of his stories have been turned into movies, but this one might take the cake for being the campiest. It’s not good. Apparently, King was on large quantities of cocaine while making this. He said in an interview that he was "coked out of my mind". It’s no wonder that he spent part of the budget securing his favorite band to do the soundtrack. 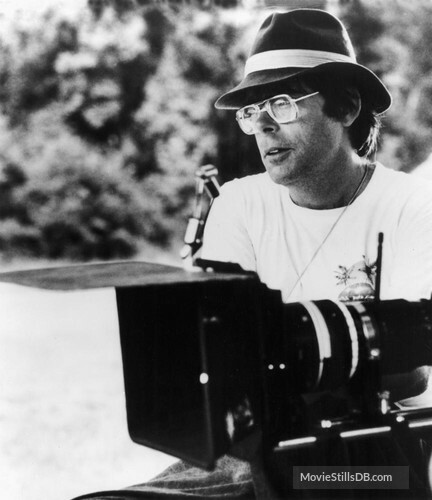 He admitted later that the film was a terrible adaptation of his work and it served as a good learning experience for him. Although King showed some promise during a few scenes. He wouldn’t try it again. It’s a great movie to watch and enjoy with friends. It’s corny, campy and terrible all at the same time. It’s the epitome of a movie that’s so bad it’s good. The editing is horrible. Writing isn’t any better. Scenes just don’t make any sense. There are obvious flaws and plot holes, but it’s all the more to laugh at and enjoy. 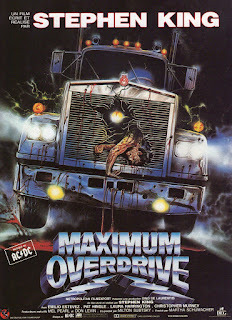 Ellen McElduff breaking down and screaming at the trucks is what movies are made for. 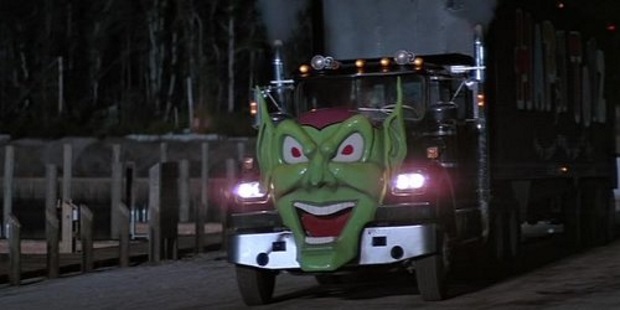 And that Green Goblin truck is really badass. 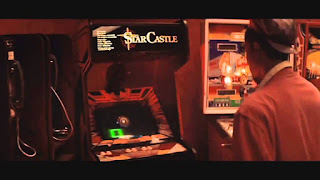 It’s interesting to note that this movie ties into the Castle Rock universe by having a character that’s traveling to Haven. 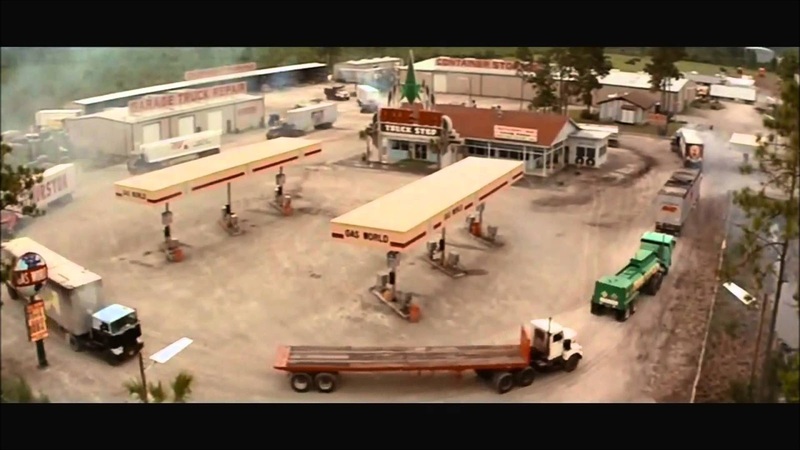 A fictional town in Stephen King’s version of his home state of Maine. I love Stephen King properties. I love his books and adaptations. Well, most of his adaptations. Dreamcatcher and The Mist leave a lot to be desired from me. But this isn’t one of the worst ones. 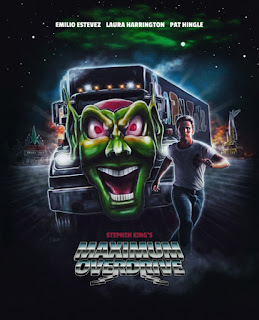 I’ve seen Maximum Overdrive countless times before. 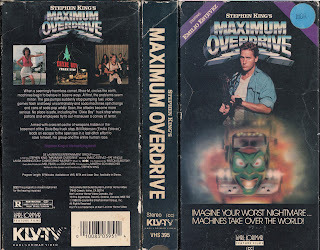 In fact, I remember watching it on TNT’s MonsterVision with friends way back in Middle School. That must have been at least 95/96. It’s weird in a strange way that keeps it entertaining. I recommend it to fans of Stephen King, or anyone looking for something to make fun of. 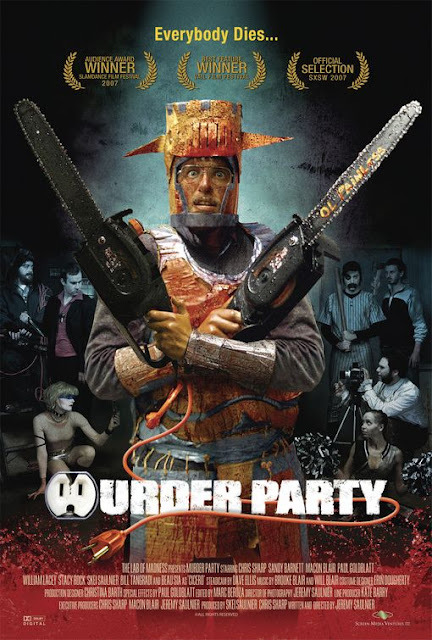 Murder Party is a 2007 independent horror comedy film from writer and director, Jeremy Saulnier. It did well on the independent film circuit, winning best feature at the 2007 Slamdance Film Festival. It stars indie actors, Chris Sharp, Sandy Barnett, Macon Blair, Paul Goldblatt and William Lacey. This has been on my watchlist for years. I always started watching it, and then ended up getting involved in something else. This time, I thought why not make this the first movie of the 2018 Edition of 31 Movies of Halloween. So here we are. Christopher responds to a random costume party invitation that will be held on Halloween night. A Murder Party to be more accurate. Dressed as a cardboard knight, Christopher arrives to find a strange costumed group that has plans for him. Murderous plans for artistic reasons. They tie Chris up and begin discussing how they want to kill him. Unfortunately, things don’t quite go the way the group intends. A series of mishaps ensue leading to one hellacious bloodbath with Christopher right in the middle! Actors/Filmmakers Paul Goldblatt, Sandy Barnett, Bill Lacey, Chris Sharp, Macon Blair and Jeremy Saulnier collectively form the The Lab of Madness. A group that had grown-up together going to school and creating movies. The group had started working on Murder Party after initial plans for a film called Moustache fell through. They couldn’t secure funding so the budget was very shoestring. According to Wikipedia, they had between $190,000 to $200,000 to work with. Murder Party is a really fun picture. I loved the detail on the characters. Christopher (Chris Sharp) was great, and although he was a pretty sad dude, you felt for him. The members of the murder group were all interesting and all told their own story. Even the dog Hellhammer. I thought William Lacey was terrific as Bill, the quiet one. Macon Blair, the drunk one, was also good. We had previously seen him in the excellent independent horror flick Green Room. This is a great movie that will make you squeamish but leave you laughing. 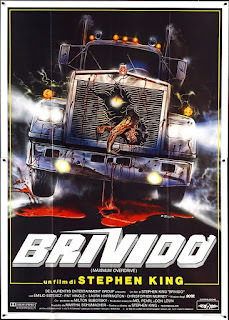 I recommend this movie if you are a fan of horror comedies like Tucker and Dale vs. 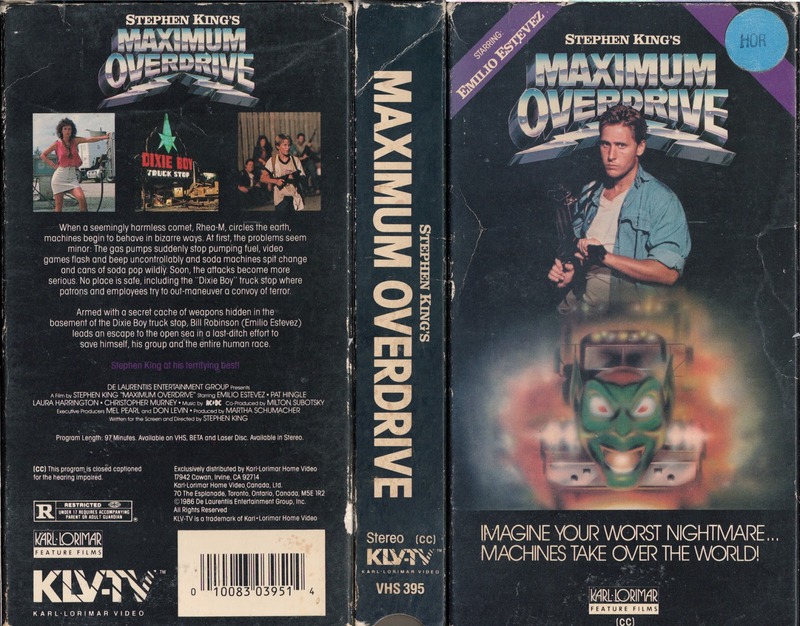 Evil or Club Dread then I would suggest picking this up. 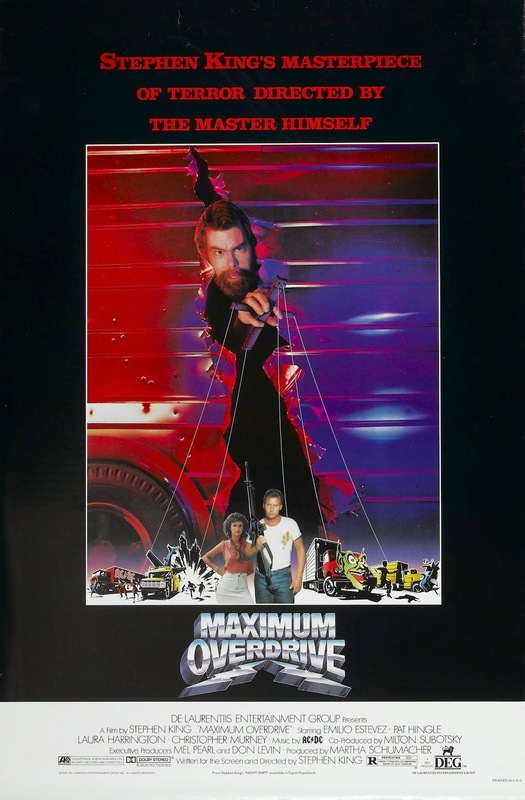 This isn’t a normal hour-and-a-half flick, it’s tight. They pack a lot of comedy, gore and suspense into a good hour-fifteen. Not bad. It’s a quick movie to digest, but it’s heavy. Filmmaker Jeremy Saulnier was clever about delivering witty humor with the gut-churning effects and not missing a beat. 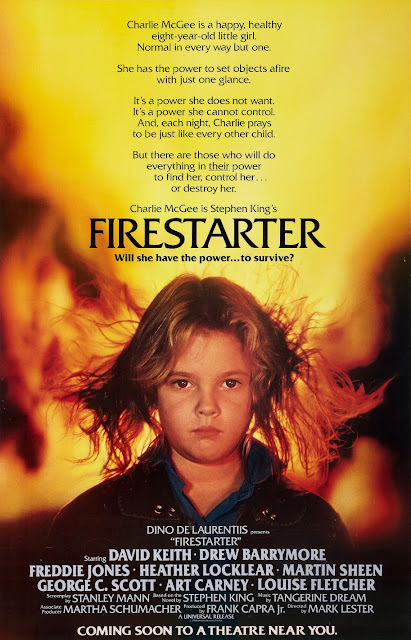 Firestarter is a science-fiction horror film released in 1984 and directed by Mark Lester. 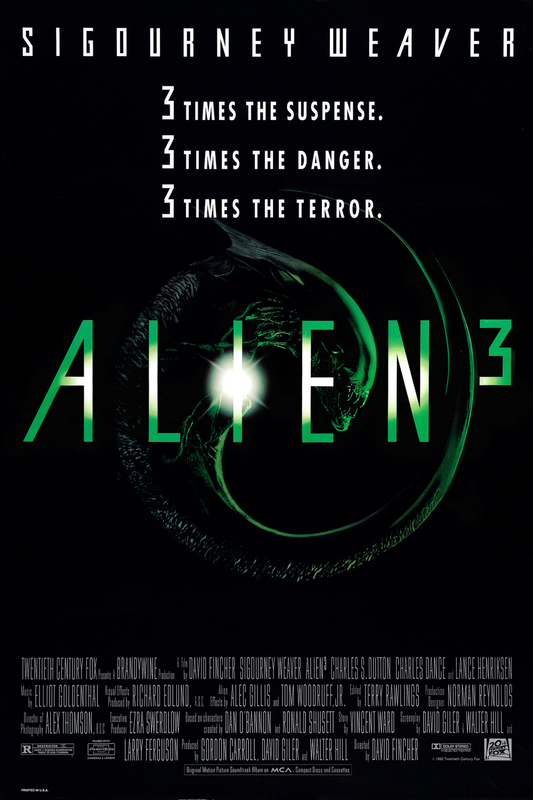 It serves as one of the many Stephen King adaptations released by the Dino de Laurentiis Company. 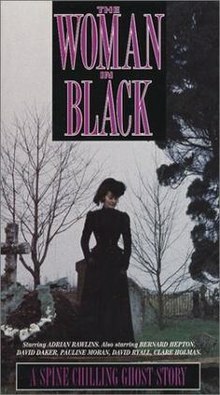 This one is based on the 1980 novel of the same name. 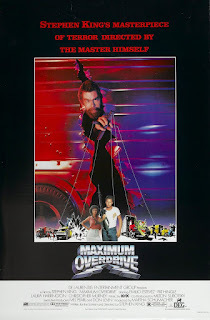 The film stars David Keith, a young Drew Barrymore, Heather Locklear, Martin Sheen and a miscast George C. Scott. The soundtrack is expertly provided by the eighties progressive rock band, Tangerine Dream. I had seen this movie a number of times before. But this was the only time that I actually sat down to review it. I am watching the Google Play version of the movie. Andy McGee and his daughter Charlie are on the run from a secret government organization known as The Shop, that is seeking them out in order to lock them up for experimentation. Andy and Charlie both have a secret psionic ability. Andy can manipulate your mind, but Charlie can set things on fire just by looking at them. Quite a dangerous power for such a little girl to have. The Shop employs a mercenary, John Rainbird to hunt the pair down with the promise of obtaining the little girl for his own… uses. This is a decent enough picture. It has a good story and the characters are all presented fairly well. George C. Scott is terrifying as John Rainbird, but he feels miscast. It’s weird since his character is literally the scariest part of the movie. There is a scene with Rainbird talking about hunting down Charlie McGee and getting inside of her… it’s just gross. It makes all the scenes of him lingering around her creepy. His breathy perseverance is perverse. It’s disgusting. Drew Barrymore was more convincing. It was annoying to see her cry and whine so much, but I liked the character of Charlie. She had good development, as that seemed to be the main focus of the film. Her relationship with her father is a good vehicle for growth. The fire effects are pretty amazing for the time. But it doesn’t do much to make the viewing all that exciting. The showdown scenes are entertaining, but all the filler with George C. Scott hunting/tricking Charlie are boring and not very exciting. The editing was poor and direction is all over the place. 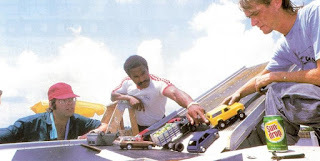 John Carpenter was originally tapped to direct, but The Thing didn’t do very well at the box office, and he was replaced by Mark Lester (Roller Boogie and Class of ‘84). Firestarter had always been a kinda guilty pleasure of mine. When I first watched the movie on television, I was too young to care about the Stephen King connection or the poor production. But as I got older I appreciated the loose threads to the Castle Rock universe. I began to understand that the movie was poor, but it still told the story and provided deep lore into Stephen King’s world. 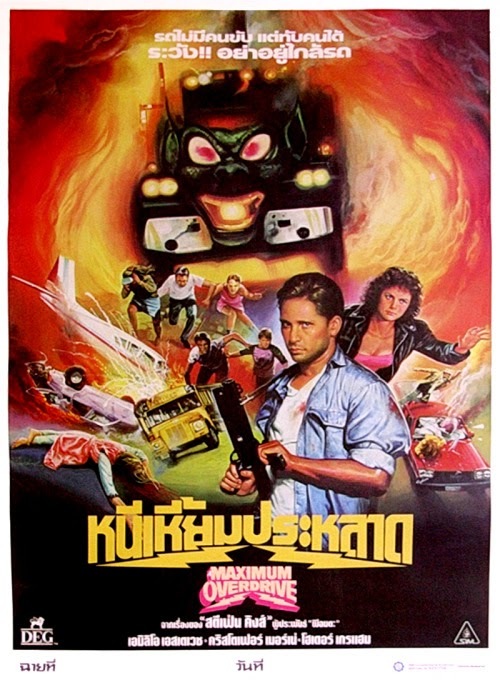 It’s best enjoyed in a marathon of bad King movies like Cat’s Eyes, Children of the Corn or Sleepwalkers. 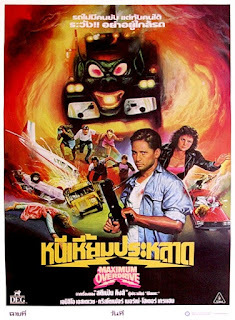 It’s not the best movie, but it’s not a bad way to kill an hour and forty-nine minutes. 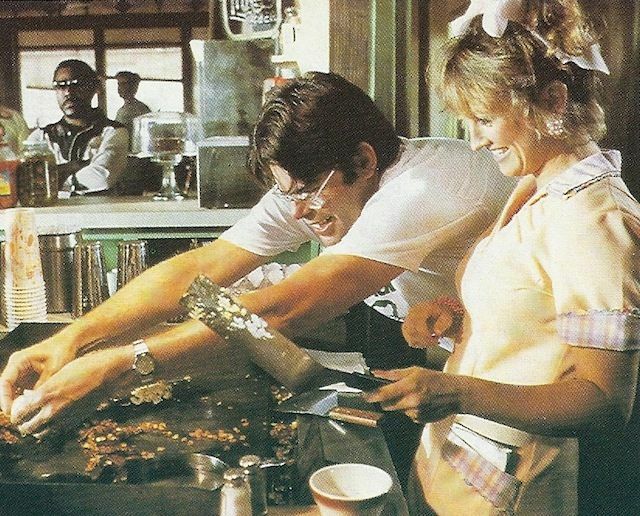 This movie ties into other Stephen King works with the inclusion of The Shop. They are a government agency responsible for a lot of big events in the universe. They created Lot 6, an experimental drug that gave psychokinetic powers to Andy, Vicky and Charlie in Firestarter. This organization is responsible for unleashing the creatures in The Mist and Dreamcatcher. In The Stand, they were tasked with getting the superflu Captain Tripps under control. They failed. While not explored further, they are an interesting part of this shared universe. Did ya know: George C. Scott wears an eye patch over his left eye during the final half hour of the film which was due to the infection caused by the contact lens used earlier in the film. The eye was not quite healed and had to wear it to complete the filming of his scenes. The scares in the movie are simple. They are events based in the supernatural. But they don’t jump out at you or slather your eyeballs in crimson corn syrup. Instead we have ghosts creepily haunting the picture. Bringing a slower and more deliberate fear to the forefront. 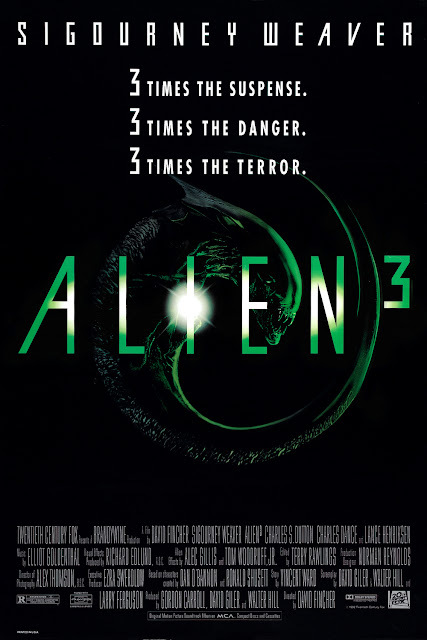 It’s something that can't be replicated by any run of the mil slasher. This kind of terror is what Hammer Horror films delivered magnificently in the sixties and seventies. 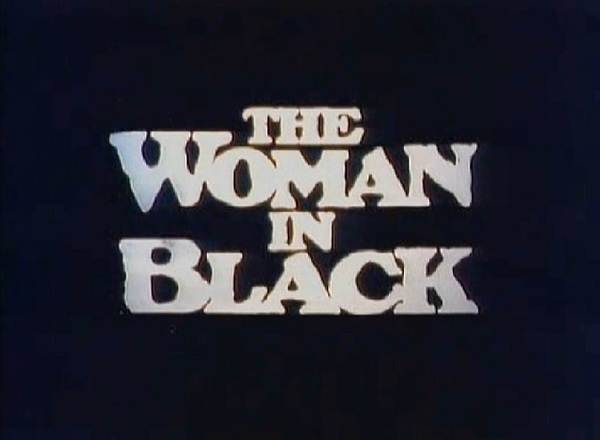 The Woman in Black is terrifying. I can really appreciate a good creepy ghost woman. I also love the more subtle and psychological scares that the movie delivers. There is a scene done in fog that relies on heavy sound. It’s intense. In fact the entire movie relies heavily on sound. This is a great for movie buffs that want to find something more rustic and worn for a good Halloween playlist. It’s definitely a fall movie.